"...Once any dunder-headed investigator tumbles to the trick, the murderer's done for. Of course, he's done for whatever trick he uses, once they know how he faked his alibi or concealed his weapon; but he's finished, tied, and triple-damned when the impossible situation is shown not to be impossible at all." Last month, I posted a review of John Russell Fearn's The Silvered Cage (1955), originally published as by "Hugo Blayn," which was a late entry in the author's Dr. Hiram Carruthers series, but the official policeman from that book, Chief Inspector Mortimer Garth, cleared up at least two cases on his own – appearing solo in Except for One Thing (1947) and The Five Matchboxes (1948). Dr. Carruthers only seems to have appeared unaccompanied in Flashpoint (1950). So that would make What Happened to Hammond? (1951), Vision Sinister (1954) and The Silvered Cage crossovers between two different (series) characters. 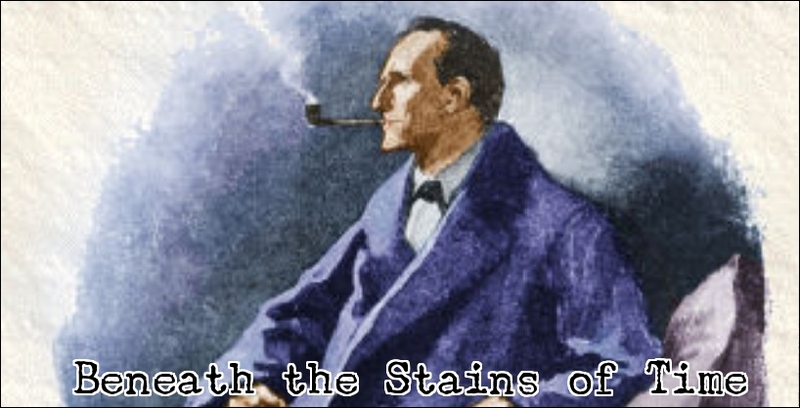 From what I gathered, Carruthers becomes entangled with Garth's investigations when a problem has all the hallmarks of an impossible crime, however, this is not a rule set in stone. One of Garth's solo cases concerns a fatal shooting inside a locked and guarded room that he managed to explain without the assistance of the scientific consultant of Scotland Yard. The Five Matchboxes opens with a domestic scene in the middle-class home of a modest stockbroker, Granville Collins, who's quarreling with his wife, Beatrice, over him scolding their 12-year-old son, Derek. So a pretty normal household by all accounts, but the underpinning reason for Granville's irritation will reveal itself to be a key element in his impending death. A crime that has not yet been committed, but already is giving a certain police inspector indigestion. Someone has dispatched an ominous letter to the Assistant Commissioner, warning the authorities that Granville Collins, at a specific time, will "be shot in his office in Terancy Street," which ended with the suggestion to "guard the place carefully" - a task the A.C. delegated to Chief Inspector Garth and Sergeant Whittaker. Well, they keep a close eye on the place during the period indicated in the letter, but they can only sit and watch as a plainclothes policeman, "detailed to watch the inside of the building," hears a gunshot emanating from the locked office. A glass pane of the door has to be smashed to gain entrance and found the stockbroker sprawled beneath one of the windows. Shot through the heart! On the desk blotter, set down neatly in a row, are five empty matchboxes. Fearn was a great admirer of John Dickson Carr and nowhere is his adoration for the undisputed master of the locked room ploy more apparent then here. Obviously, the explanation for the apparent impossible murder of Collins leans on plot-ideas from a number of Carr's Dr. Gideon Fell novels, but Fearn has to be complimented for the way in which he repurposed these ideas – using the victim's dyspepsia, the empty matchboxes, a sash window and a freak occurrence to explain how the murder was committed. So the locked room angle does not break any new ground. However, the elements were used very well indeed. Something else that shows Carr's influence on Fearn is the eccentric behavior of the victim when he was at his office: Collins used to walk sedately up, and down, the stairs of the building, but would ran along a dark corridor like a bat out of hell. The explanation is easy enough, but helped to give the story a "sense of ghostliness" and strangeness often found in Carr's own work. And the behavior tied-in with a secondary plot-thread that was woven into the main plot. After the halfway mark, Garth uncovers a link with a fifteen-year-old murder case, known in the newspapers as "Clothes Cupboard Mystery," in which a rich recluse, Mrs. Beryl Cleveland, was found "suspended by the neck from the roof beam of a hall clothes cupboard" in somebody else's home – who turned out to be closely associated with Collins. Garth reasons the truth behind this murder based on grass stains on the victim's clothes, the cupboard and Collin's behavior. A good and solid example of Fearn's preferred method of plotting he called webwork, or webworking, which is a technique that should please plot-oriented mystery readers. I suppose this makes The Five Matchboxes also a predecessor of a present-day adherent of Carr, namely Paul Halter, who wrote some locked room mysteries with links to past murders. So the plot, while not a classic of its kind, is still a pretty competent job by this second-stringer among the Golden Age mystery writers, but the book has one notable weakness: the who-dun-it aspect of the crime is underwhelming. The pool of genuine suspects is very shallow and barely leaves any room to actually surprise the reader with the revelation of the killer's identity. You should not pick this one up if you're looking for something along the lines of Agatha Christie. However, the previously mentioned webwork plotting, which makes a pretty conundrum out of the how of the crime and how the characters are connected with one another, is pleasing enough to make up for that weakness. 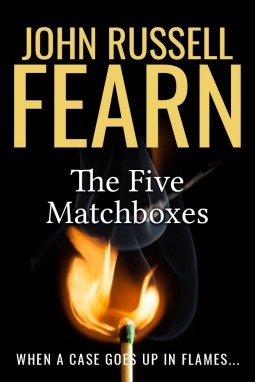 Lastly, I have to point something out about Fearn's various series-characters: he seems to have been better at creating normal, down-to-earth detectives than he was at creating odd and eccentric sleuths. Adam Quirke from The Lonely Astronomer (1954) must be one of the most annoying characters in both the mystery and SF genre. Chief Inspector Douglas Gossage from The Crimson Rambler (1947) is only memorable for his unhealthy, brick-red complexion and the previously mentioned Dr. Hiram Carruthers is considered to be obnoxious, but the colorless Garth and Miss Maria Black (the Miss Hildegarde Withers of England) are very normal characters – who are far more convincing as detectives than the more eccentric counterparts. However, you have to keep mind that Fearn wrote under forty-some different pennames. So not every single one of his creations is going to be top-drawer stuff. 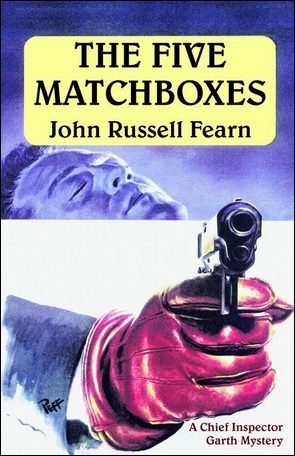 All in all, I found The Five Matchboxes to be a competent detective story with some clever aspects about it, but you have to keep in mind that Fearn was a second stringer and does not quite reach the same heights as his more famous contemporaries. However, by his own standards, this was vastly superior to such novels as The Silvered Cage and only a step or two behind the best titles from his Miss Maria Black series, e.g. Thy Arm Alone (1947) and Death in Silhouette (1950). By the way, am I the only one, alongside John Norris, who has not only read Fearn, but did so with some enthusiasm? Even as a second-stringer he's grossly underrated and deserves to be remembered as a high-spirited player of, as Carr described it, the Grandest Game in the World. Hope someone else chimes in about Fearn. It'd be sad to think that we're in the smallest mystery writer fan club in the world. You've now covered all the Fearn novels I've read. Have you come across any of his other Hugo Blayn books? I was doggedly hunting those down for a while several years ago and was very pleased when I found three of them in the original UK editions with DJs. As "Blayn" he wrote a rather good inverted detective novel called EXCEPT FOR ONE THING. I have copies of WHAT HAPPENED TO HAMMOND? and FLASHPOINT still unread. Maybe I'll pull them out and read/review for later this month. Also... the Mordecai Tremaine piece is coming (finally) this week. Took me long enough! Actually, I've not covered every single title you've read or discussed. Maria Marches On is still on the big pile and have yet to acquire a copy of Vision Sinister, but I'm actually catching up to you, John! I would still welcome your views on What Happened to Hammond? and Flashpoint. Nobody else has reviewed them and they're both locked room novels. I suspect Flashpoint might be the better of those two, because Fearn's impossible crime plot are at their best when he keeps them relatively simple and the plot description of Hammond promising something on par with The Silvered Cage (i.e. very elaborate and overly ingenious). So, yes, you should take a look at them later this month. You might also be interested to learn that there's a short story collection of Fearn's crime and detective fiction, which has a cover illustration screaming "alternative crime" and "pulp." The title is Liquid Death and Other Stories. Looking forward to your view on the Mordecai Tremaine novels! I've some good news for you, Yvette. A large selection of his work is currently available in both paperback and ebook editions, but you really have to know what you're looking for, because the reprints cover a wide variety of genres - such as mysteries, science-fiction and westerns. I recommend his splendid, but short-lived, Miss Maria Black series that began with Black Maria, M.A. and includes Thy Arm Alone, One Remained Seated and Death in Silhouette. I hope this helps getting you started. I had already run over to Abe Books and ordered a Fearns book that sounded good - one I could afford at any rate. It's called THE MAN WHO WAS NOT. (Don't tell me if it's not a good one since it's ordered and on its way.) But I'll note your recommendations for the future. I've not read The Man Who Was Not, but it's one of Fearn's impossible crime novels and hopefully also a good one. Let us know! Is that top cover from the Kindle edition? It's stolen from the 1961 Pan edition of 'The Sapphire Conference' by Peter Graaf (aka Sam Youd/John Christopher). Rather cheeky! No, the top one is, I think, one of the wildside press editions. They have similar cover art for some of Fearn's other detective novels. Just did a search for the 1961 Pan edition you mentioned and cheeky is a mild qualification. It's one of the most blatant examples of a blatant ripoff I have ever seen! "I knew Sam personally and made an arrangement with him to re-use his wonderful covers. It was all above board. It is also standard practice in the publishing industry, where covers are resold and recycled all the time. "